The "remix" album, so to say, from the band that brought us the masterpeice "La Masquerade Infernale" and the great debut "Aspera Hiems Symphonia". This album serves as an album with rare unreleased versions of songs from previous albums, including an unreleased new track just to give us a small taste of what is to come in the future from this band. The new track, entitled "Depection Genesis" is a great song to say the very least. Hellhammer lays down a great rock beat that is flawless, while Garm uses a kind of robotic flange effect on his voice that makes the track seem very atmospheric. Not much guitar is used at all, except for small parts thoughout the song, but it has been replaced with the use of the bass guitar which is a really cool effect. The production is phenominal, you can hear every insturment cleary (including the bass!) and this makes the album better. The rest of the album serves up some interesting versions of old songs, including a techno version of "Alone", "The Throne of Tradegy" and even "La Masquerade Infernale". The biggest surprise on the whole album was the remix of "Master of Disguise" which is a rap version of the song. But it doesn't end there, as there are 3 more songs after that with weird twists to them. "Deception Genesis" is a great new track, that teases you and makes you want a new Arcturus album in the near future, but the rest of the album is something i could live without. If you are in the market for a really interesting remix album, or looking for something new, then this is the album for you. 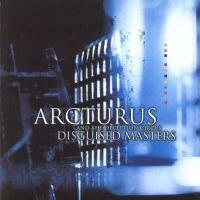 Arcturus has shown that they will do anything they want, when they want to regardless of genre and judgements.